This article is about the Star Wars character. For other uses, see Yoda (disambiguation). Yoda (/ˈjoʊdə/) is a fictional character in the Star Wars franchise created by George Lucas, first appearing in the 1980 film The Empire Strikes Back. In the original films, he trains Luke Skywalker to fight against the Galactic Empire. In the prequel films, he serves as the Grand Master of the Jedi Order and as a high-ranking general of Clone Troopers in the Clone Wars. Before his death in Return of the Jedi at the age of 900, Yoda was the oldest living character in the Star Wars franchise in canon, until the introduction of Maz Kanata in The Force Awakens. Frank Oz provided Yoda's voice in each film and used his skills as a puppeteer in the original trilogy and Star Wars: Episode I – The Phantom Menace. 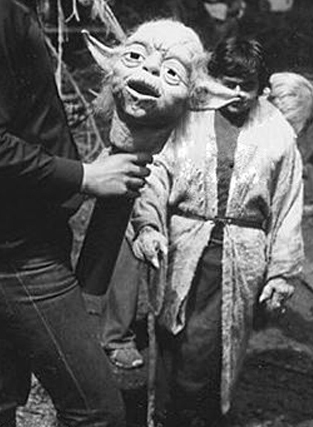 For some walking scenes in Episodes V and I, dwarf actors Deep Roy and Warwick Davis appeared in costume as Yoda (though neither was credited). While Frank Oz served as the primary performer, he was assisted by a multitude of other puppeteers, including: Kathryn Mullen (Ep. V), Wendy Froud (Ep. V), David Barclay (Ep. V-VI), Mike Quinn (Ep. VI), David Greenaway (Ep. I & VI), Don Austen (Ep. I), and Kathy Smee (Ep. I). For the radio dramatizations of The Empire Strikes Back and Return of the Jedi, Yoda was voiced by John Lithgow, while Tom Kane voiced him in the Clone Wars animated series, several video games, and the series Star Wars: The Clone Wars. George Lucas had originally conceived of Yoda's full name as being "Minch Yoda" before shortening it. The make-up artist Stuart Freeborn based Yoda's face partly on his own and partly on Albert Einstein's. In The Phantom Menace, he was redesigned to look younger. He was computer-generated for two distant shots, but remained mostly a puppet. The puppet was re-designed by Nick Dudman from Stuart Freeborn's original design. Rendered with computer animation in Star Wars: Episode II – Attack of the Clones and Star Wars: Episode III – Revenge of the Sith, Yoda appeared in ways not previously possible, including his participation in elaborate fight scenes. In Revenge of the Sith, his face appears in several big close-ups, demanding highly detailed CGI work. His performance was deliberately designed to be consistent with the limitations of the puppet version, with some "mistakes" made such as the occasional ear-jiggling. Rob Coleman was responsible for the character's new incarnation to the series. Yoda was recreated in CGI for the 2011 Blu-ray release of The Phantom Menace. A clip of the new CG Yoda from The Phantom Menace was first seen in the featurette The Chosen One, included in the 2005 DVD release of Revenge of the Sith. The 2012 theatrical 3D release of The Phantom Menace also features the CG version of Yoda. Jedi Grand Master Yoda is amongst the oldest, most stoic and most powerful known Jedi Masters in the Star Wars universe. Series creator George Lucas opted to have many details of the character's life history remain unknown. Yoda's race and home world have not been named in any official media, canonical or otherwise, and he is merely said to be of a "species unknown" by the Star Wars Databank. 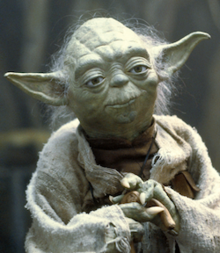 Yoda's characteristic speech patterns have been analyzed and discussed by academic syntacticians, who found it somewhat inconsistent, but could extrapolate that it has object–subject–verb word order making it an anastrophe. The films and expanded universe reveal that he had a hand in training almost every Jedi Master in the galaxy, including Count Dooku, who is identified in Attack of the Clones as Yoda's old Padawan Learner; Mace Windu; Obi-Wan Kenobi (partially, before Qui-Gon Jinn takes over as Obi-Wan's master); Ki-Adi-Mundi, Kit Fisto and eventually Luke Skywalker. During the animated series Star Wars: Clone Wars, set between Attack of the Clones and Revenge of the Sith, he mentions that he trained another one of the leaders on the Jedi Council, Master Oppo Rancisis. In the Star Wars prequel films, he instructs several younglings in the Jedi Temple before they are assigned to a master. This was displayed in a scene in Star Wars Episode II: Attack of the Clones. In The Empire Strikes Back he mentioned that he had been training Jedi "for 800 years", which means he must have been a Master Jedi for quite some time before that. Yoda makes his first film appearance in The Empire Strikes Back. Luke Skywalker (Mark Hamill) arrives on Dagobah to seek his guidance, having been instructed to do so by the Force ghost of Obi-Wan Kenobi (Alec Guinness). Yoda does not initially identify himself to Luke and instead tests his patience by presenting himself as a comical and senile backwater individual, deliberately provoking both Luke and R2-D2 (Kenny Baker). Luke is shocked when he finally realizes that this small, elderly creature is the powerful Jedi Master he was seeking. Finding that Luke has the same anger and recklessness which caused his father's downfall, Yoda is reluctant to teach him in the ways of the Force, and agrees only at Obi-Wan's behest. Before finishing his training, however, Luke chooses to leave Dagobah in order to confront Darth Vader and save his friends at Bespin. Yoda and Obi-Wan warn him that he is not ready to face Vader and is being lured into a trap, but Luke leaves anyway, promising to return. When Obi-Wan laments that Luke is their "last hope," Yoda reminds him that "there is another". Yoda makes a brief appearance in Return of the Jedi, set a year after The Empire Strikes Back. Yoda, now sick and frail, informs Luke that he has completed his training but will not be a Jedi until he confronts Darth Vader; he also confirms that Vader is Luke's father, something Vader had told Luke in the previous film. Yoda then peacefully dies at the age of 900, his body disappearing as he becomes "one with the Force". He leaves Luke with the knowledge that "there is another Skywalker" (his last words). Moments later, Obi-Wan's ghost helps Luke come to the realization that the "other" of whom Yoda spoke is Princess Leia (Carrie Fisher), who is his twin sister. In the film's final scene, after the Empire has been defeated, Luke sees Yoda's spirit looking upon him with pride, alongside Obi-Wan and the redeemed Anakin Skywalker (Vader's former Jedi self). Yoda returns as a younger version of himself in the prequel trilogy beginning with The Phantom Menace. The film marked the final time Oz would portray the character as a puppet, until the release of The Last Jedi (2017). However, in the 2011 Blu-ray release of The Phantom Menace, the Yoda puppet was replaced by a CGI character to match the later depiction of the character. In the film, which is set 35 years before The Empire Strikes Back, Jedi Master Qui-Gon Jinn (Liam Neeson) brings the young Anakin Skywalker (Jake Lloyd) to the Jedi Council. Qui-Gon is convinced that Anakin is the "Chosen One" of Jedi prophecy who will bring balance to the Force, and requests the boy be trained as a Jedi. Yoda senses great fear in Anakin, especially in regards to his attachment to his mother, and foresees "grave danger" in his training. The Council, led at the time by Yoda's former padawan Mace Windu (Samuel L. Jackson), rejects Qui-Gon's request. When Qui-Gon is mortally wounded in a duel with Sith Lord Darth Maul (played by Ray Park and voiced by Peter Serafinowicz), his dying request to his Padawan Obi-Wan Kenobi (Ewan McGregor) is that Anakin be trained as a Jedi. Obi-Wan, determined to fulfill his promise to his master, tells Yoda that he will train the boy, even without the Council's approval. Yoda makes Obi-Wan a Jedi Knight, and reluctantly gives his blessing to Anakin's training. Yoda makes his first CGI appearance in Attack of the Clones. Set a decade after The Phantom Menace, Yoda, now in direct control of the Order's policy as Master of the High Council in addition to his traditional position as Grandmaster, is one of the many Jedi who are concerned about the emergence of the Separatists, a group of systems rebelling against the Galactic Republic. After the first attempted assassination of Senator Padmé Amidala (Natalie Portman), Chancellor Palpatine (Ian McDiarmid) "suggests" that she be put under the protection of Obi-Wan, who is training Anakin (now played by Hayden Christensen). At the climax of the film, Yoda arrives in time to save Obi-Wan and Anakin from the Separatists and defeats his former apprentice, Count Dooku (Christopher Lee), in a lightsaber duel. In Revenge of the Sith, Yoda leads the Jedi Council in pursuing the mysterious Sith Lord Darth Sidious. Palpatine has by now amassed near-dictatorial emergency powers, and begins interfering in Jedi affairs by appointing Anakin as his personal representative on the Council. The Council grants Anakin a Council seat, but denies him the rank of Master, feeling that doing so would amount to giving Palpatine a vote in the Council. Additionally, they order him to spy on Palpatine, whom Anakin considers a friend and mentor. Confused and angered by the perceived snub and the instructions to commit what he believes to be treason, Anakin continues to lose faith in the Jedi Order. Anakin seeks Yoda's counsel about his prophetic visions that someone close to him will die. Yoda, unaware of the person Anakin speaks of is Padmé, or that she is Anakin's wife and pregnant with his child, tells him to "train himself to let go of everything that he fears to lose". Unsatisfied, Anakin turns to Palpatine, who then reveals himself as Darth Sidious. Palpatine manipulates the young Jedi into becoming his Sith apprentice, Darth Vader, with the promise that the dark side holds the power to save Padmé from dying in childbirth. Palpatine later transforms the Republic into the tyrannical Galactic Empire, proclaiming himself emperor for life, and orders the clone troopers to kill their Jedi generals. At this time, Yoda is on Kashyyyk, overseeing the battle between the Separatist forces and a combined command of clone troopers and Wookiees. Through the Force, Yoda feels the deaths of each of the Jedi as they are assassinated by their own troops. After swiftly killing the clone troopers instructed to kill him, he escapes with Wookiee leaders Tarfful and Chewbacca (Peter Mayhew), and returns to Coruscant, where he and Obi-Wan fight their way into the Jedi Temple to stop a trap for all surviving Jedi. Inside, they discover that all the Jedi inside, younglings included, have been slaughtered. They then discover a holographic recording, revealing Vader as the assassin. Yoda decides to face Palpatine, sending Obi-Wan to kill Vader. When Obi-Wan protests, Yoda tells him that the Anakin he knew no longer exists, having been "consumed by Darth Vader". Subsequently, Yoda battles Palpatine in a lightsaber duel that wrecks the Senate Rotunda. In the end, neither is able to overcome the other and Yoda is forced to retreat. He goes into exile on Dagobah so that he may hide from the Empire and wait for another opportunity to destroy the Sith. At the end of the film, it was revealed that Yoda has been in contact with Qui-Gon's spirit, learning the secret of immortality from him and passing it on to Obi-Wan. Yoda is also instrumental in deciding the fate of the Skywalker children after Padmé dies in childbirth, recommending that Luke and Leia be hidden from Vader and Palpatine in remote locations. Other than the ancient Jedi Master, only the Organas, the Lars family, R2-D2 and Obi-Wan know of their true identities. In The Force Awakens, set 30 years after Return of the Jedi, Yoda's voice is heard by the young scavenger Rey (Daisy Ridley) after she discovers Luke Skywalker's lightsaber. In Star Wars: The Last Jedi, Yoda appears to Luke as a Force spirit as Luke debates whether to burn down the tree storing the only remaining copies of the Sacred Texts of the Jedi. As Luke makes his way to the tree, Yoda appears behind him and talks to Luke about the inner conflicts going on inside him and reminds him that a Jedi must always be sure of his path. When Luke decides against burning down the tree and destroying the texts, Yoda summons a lightning bolt down upon the tree, setting it ablaze while Luke steps back in horror at the sight of the texts seemingly being lost forever (unaware that Rey had taken them earlier as she left the island.) When confronting Yoda as to why he did it, Yoda tells Luke that the true Jedi knowledge is within Jedi themselves and it is their responsibility, not books, to pass that knowledge on and continue the way of the Jedi. As Luke takes in the message, he sits with Yoda and shares a quiet moment with his former master. Unlike in the prequels, where fight scenes necessitated the character be rendered in with computer-generated imagery, Yoda is once more portrayed using puppetry. Yoda will appear in Star Wars: The Rise of Skylwalker. Yoda appears in Star Wars: The Clone Wars, voiced by Tom Kane. In the prequel film Star Wars: The Clone Wars, Yoda assigns Anakin Skywalker his own Padawan, Ahsoka Tano, as he believes that she will help Anakin grow as a Jedi and as a person. Throughout most of the series, Yoda spends his time on Coruscant with the Jedi Council, but he occasionally leaves for certain tasks, such as negotiations with King Katuunko on Rugosa, and a confrontation with Asajj Ventress' droid army. Yoda also watches over Anakin and Ahsoka throughout the series, pleased that they are both maturing due to each other's influence. However, in the final arc of season five, Ahsoka is framed for a crime she didn't commit, and Yoda and the Jedi Council expel her, at the demand of Admiral Tarkin, and turn her over to the Republic military. Along with other members of the Council, Yoda observes Ahsoka's trial, but Anakin bursts in with the true culprit, Barriss Offee, before the verdict can be read. Afterwards Yoda, Anakin and the Council personally invite Ahsoka to rejoin the Order, but to their shock, she refuses and leaves. According to Dave Filoni, Yoda blames himself for Ahsoka's departure, as he had made her Anakin's padawan in the first place. In the final arc of the final season, Yoda hears Qui-Gon Jinn speaking to him from beyond the grave. Yoda flees the Jedi Temple with R2-D2 to travel to Dagobah, the planet he would make his home when he enters exile after events of Revenge of the Sith, to find answers. Shown cryptic visions of the fall of the Jedi, Yoda learns he has been "chosen" to learn how to manifest his consciousness after death as a Force ghost. Yoda is tested by a group of spirit priestesses in order to overcome trials and temptations on his pilgrimage; one of these tests is to face an illusion of ancient Sith lord Darth Bane. Yoda's final test is to resist an attempt by Darth Sidious and Dooku to lure him to the dark side with a false vision of deceased Jedi Master Sifo Dyas. Yoda engages in a metaphysical battle with Sidious, and appears to sacrifice his life in order to save Anakin's - only to awaken and discover that the battle was merely a vision, and that he has passed the test. The priestesses inform Yoda that his training will resume in time. Yoda was heard in the Star Wars Rebels episode "Path of the Jedi" with Frank Oz reprising the role for the first time since Revenge of the Sith. He communicates with Padawan Ezra Bridger and his master Kanan Jarrus during their experience in an ancient temple on Lothal, and helps the pair do some soul-searching to analyze their true motivations. He appears physically for the first time, in the season 2 episode "Shroud of Darkness", in which he tells Ezra he should find Malachor and reunites with Ahsoka after nearly 20 years. Yoda appears in the 2003 Cartoon Network animated television series Star Wars: Clone Wars, voiced by Tom Kane. In the show, Yoda is made a General, like many of the Jedi Knights and Masters. Yoda escorts Padmé on their journey to an unspecified planet, but Yoda senses several Jedi in distress on Ilum. Using the Jedi mind trick to convince Captain Typho to take them to Ilum, Yoda saves two Jedi Knights and finds a message from Count Dooku giving orders to destroy the Jedi Temple on Ilum. In the animated series' final episode, Yoda fights side by side with Mace Windu to defend Coruscant, which is under attack from the Separatists. The two Jedi Masters realize too late that the battle is a distraction; Separatist leader General Grievous truly intends to kidnap Palpatine. The Jedi Master's effort to stop Grievous fails, and Palpatine is taken hostage, thus setting the stage for Revenge of the Sith. Yoda acts as a supporting character in Dark Horse Comics' Clone Wars tie-in comic books. He is also an important character in several novels set in the Star Wars universe, particularly Yoda: Dark Rendezvous. In 2007, Yoda was selected by Empire magazine as the "25th greatest movie character of all time". On their list of the 100 Greatest Fictional Characters, Fandomania.com ranked Yoda at number 60. Yoda also appears in Disney's Star Tours: The Adventures Continue attraction, where he is voiced by his original voice actor, Frank Oz. A life-size statue of Yoda greets visitors to Lucasfilm's Letterman Digital Arts Center in San Francisco's Presidio, the headquarters of Industrial Light and Magic. American musician and parody artist "Weird Al" Yankovic used the character as inspiration for a parody of The Kinks' "Lola", in a song entitled "Yoda." A Queen Mary University of London linguist claims Yoda's language resembles Hawaiian the most. TomTom has included a "Yoda" voice as one of the Celebrity GPS voicings in their "Star Wars" voice series. Lego's Yoda minifigure was the first of their figures to be shorter than the other toys in the Lego Star Wars line; it has shorter legs than the other action figures. Yoda appears in a television series based on the Lego Star Wars toys, created by the Lego company, among them Lego Star Wars: The Yoda Chronicles, Lego Star Wars: The Padawan Menace, Star Wars: The New Yoda Chronicles, and Lego Star Wars: Droid Tales. ^ "The Making of Yoda". ^ "Dogabah Second Unit Still". ^ "Deep Roy as Yoda". Archived from the original on 2014-07-14. ^ "Star Wars make-up artist Stuart Freeborn dies aged 98". BBC News. 2012-03-04. Retrieved 2013-02-06. ^ "Stuart Freeborn, Yoda's maker, dies". The Guardian. Retrieved February 8, 2013. ^ Hauptfuhrer, Fred (9 June 1980). "Yoda Mania: America Falls in Love with the 26–Inch, Green, Pointy-Eared Sage and his Master Puppeteer, Frank Oz". People. Retrieved December 17, 2012. ^ Desowitz, Bill (2002-06-14). "Yoda as We've Never Seen Him Before". Animation World Magazine. Archived from the original on 2012-06-01. Retrieved 2008-11-13. ^ "Yoda Goes CGI in 'Star Wars: Episode I - The Phantom Menace' on Blu-ray". Hi-Def Digest. 2011-08-25. Retrieved 2011-08-26. ^ Gould, Chris. "Star Wars: Episode III - Revenge of the Sith". dvdactive. Retrieved 2009-03-04. ^ Pullum, Geoffrey K. (2005-05-18). "Language Log: Yoda's syntax the Tribune analyzes; supply more details I will!". Itre.cis.upenn.edu. Retrieved 2013-02-08. ^ Breznican, Anthony (December 16, 2017). "The Last Jedi spoiler talk: How an old-school Star Wars character made a surprising return". Entertainment Weekly. Time Inc.: 2. Retrieved April 12, 2018. ^ Bryant, Jacob (21 December 2015). "Obi-Wan, Yoda Secretly in 'Star Wars: The Force Awakens'". Variety. Retrieved 8 November 2016. ^ McCluskey, Megan (December 15, 2017). "An All-Time Favorite Star Wars Character Makes an Epic Cameo in The Last Jedi". Time. Time Inc. Retrieved April 12, 2018. ^ Evans, Nick (January 2018). "Why Star Wars: The Last Jedi Used A Puppet For Yoda". Cinema Blend. Retrieved April 12, 2018. ^ "'Star Wars' fans rejoice: Beloved character Yoda will return". New York Daily News. April 14, 2018. Retrieved April 16, 2018. ^ "Exclusive: Yoda Returns for Star Wars Rebels". tvguide.com. 15 December 2014. Retrieved 4 January 2017. ^ "Empire's The 100 Greatest Movie Characters". Empire Magazine. Retrieved 2010-05-21. ^ "The 100 Greatest Fictional Characters". Fandomania.com. Retrieved 2010-05-21. ^ Cole, Carolyn (July 23, 2012). "Frank Oz to 'Star Wars' fans: Do the Yoda impression I won't". Los Angeles Times. Retrieved September 19, 2014. ^ "Star Wars™ voices now available for TomTom devices". Starwars.tomtom.com. Archived from the original on 2010-07-12. Retrieved 2013-02-08. ^ Martell, Nevin (2009). Standing Small: A Celebration of 30 Years of the Lego Minifigure. DK. p. 69. Look up Yoda in Wiktionary, the free dictionary. This page was last edited on 14 April 2019, at 11:58 (UTC).